To foster the esprit de corps which has existed in the Battalion since its inception and its early existence as a Citizen Military Forces Special Conditions Unit. 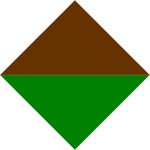 Maintain the comradeship and association which all have enjoyed over a long or short period of time as a member of the 1st/19th Battalion, The Royal New South Wales Regiment and to maintain continuing links with the Battalion and to assist the current Commanding Officer for the time being in anything he may wish to do. To perpetuate the memory of those who served in war in the units – whose names we carry, those who served in the Battalion since its inception and those who have passed on. The banner was officially presented at the Orange Ex Services Club on Saturday 8th March, 2000 by LTCOL Irwin. How the Association was Formed. 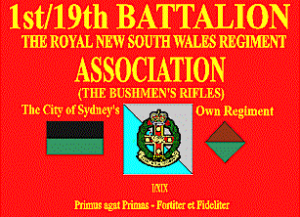 The Association was formed following the Inaugural Reserve Forces Day Parade held in Sydney on 1st July, 1998. Since then membership has grown. Currently the membership is 309 which comprises 175 former 1/19 RNSWR, 36 former 2/19 Bn AIF Association Honorary Life Members and 98 former 2/19 Bn AIF Association Associate Members. Its continuing association between past and present members is fairly unique. Patrons of the Association are former Commanding Officers. 1st/19th BATTALION THE ROYAL NEW SOUTH WALES REGIMENT ASSOCIATION INC.